Use our free Cover Creator tool to design a cover for your eBook or paperback. The tool allows you to customize your cover with a variety of layouts and fonts. Cover Creator uses the book details you enter during title setup and adds your book's ISBN to the barcode area of the back cover. Many Cover Creator templates allow you to choose an image from our image gallery or upload your own image. The tool accepts JPG, PNG and GIF files. Note: Cover Creator isn't supported on kdp.amazon.co.jp. Is Cover Creator right for my book? Can I download Cover Creator and the cover I design in the tool? 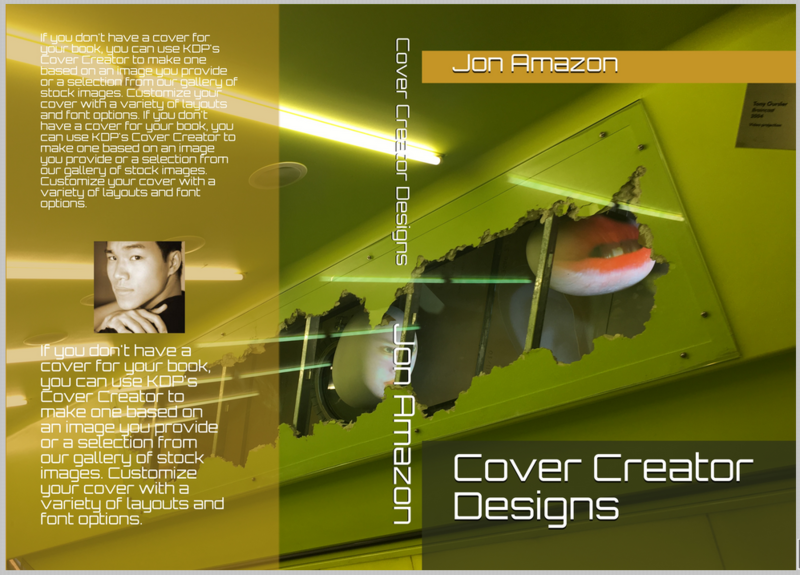 Did you use Cover Creator on CreateSpace? Cover Creator is a free tool intended to help you design a basic cover that meets KDP specifications. To see the kind of cover you can create with the tool, check out these examples. If Cover Creator doesn't meet your formatting needs, try our do-it-yourself guidelines (eBook and paperback) and templates (paperback). Or hire a professional designer. To get ideas and help from other authors, visit the KDP Community. When designing your cover, think about how your choices will resonate with readers in your genre. For design ideas, see the three examples below. Image. The author used his own high-resolution image. Font. "Obitron" for the front, back cover, and spine text. Layout. The chosen template places the author name, title, and back cover text so that they don’t obscure the key parts of the cover image. Image. Chosen from the "Relationship" section of the Cover Creator image gallery. Font. "Great Vibes" for title and author name; "Poiret One" for spine and back cover text. Layout. The chosen template adjusts the image size so that the reader can see the man and the woman. Font. "Philosopher" for the front, back cover, and spine text. Layout. 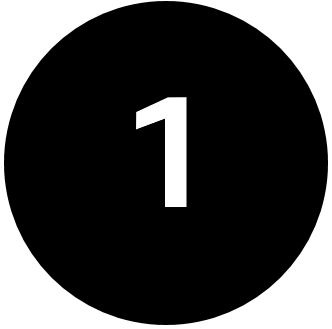 The image-only template was used with the text placement template to best accommodate the image. To use the tool, you need to have created a title on your Bookshelf. If you've created a title, sign in to your account, go to your Bookshelf, and continue setting up your book. On the Content page, scroll down to the cover section and click Launch Cover Creator. Upload your own cover photo or use KDP's stock images. If you want to use your own photo, make sure it meets our guidelines and that it's high resolution. When choosing from the stock images, test several until you've found the right fit for your book. Next you'll choose a layout, color scheme, and font. When choosing colors and fonts, make sure that your text is legible. Text can be illegible if the font and background color is too similar. Your cover text should also be large and clear enough. Preview your cover to see what it will look when printed. Make sure the information on your cover (e.g., title, author name) exactly matches the book details you entered. If you're not satisfied with your cover, you can start over. When you're done, click Save & submit. Cover Creator and covers made using stock images available in the Cover Creator tool cannot be downloaded for use outside the KDP website. Click anywhere on the cover, except where other elements (e.g., text boxes) are. The dialog box "Edit cover image" will appear with options to choose a new image or change the current image's size, position, and rotation. To provide the best customer experience, please follow our Metadata Guidelines. Make sure the title, subtitle, author name, and series information on your cover match the book details you entered during title setup. If you used Cover Creator to design your eBook cover, we'll help you add a spine and back cover for your paperback. You can choose different designs for your eBook and paperback covers. If you want text on the spine (e.g. title, author name), your paperback must have at least 100 pages. Learn more about formatting images for your paperback. CreateSpace Cover Creator designs aren't compatible with Cover Creator on KDP. 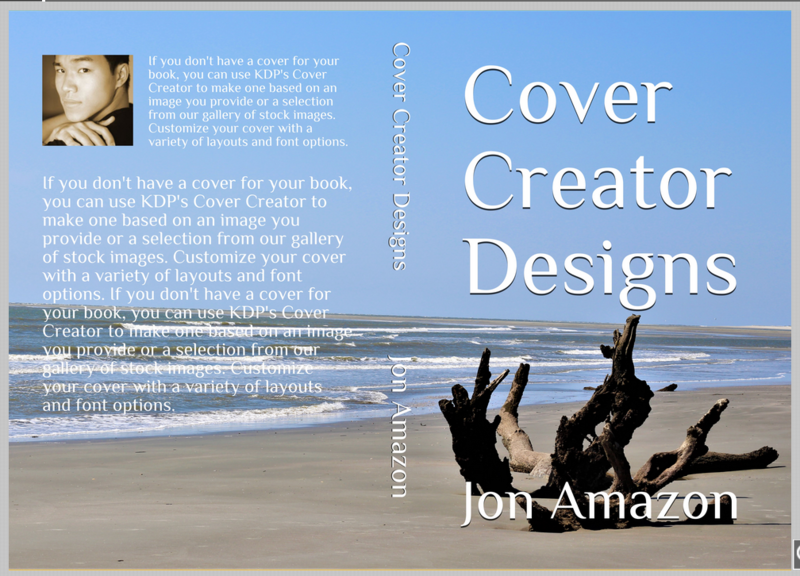 If you want to update your cover after it moves to KDP, you need to design a new one using KDP's Cover Creator. You can also use our templates. Click the ellipsis button (…) under the Paperback Actions menu and then click Edit Paperback Content. Scroll down to Book Cover and click Launch Cover Creator. Upload your JPEG cover file and click Next. Choose the second design from the left on the top row. This design accommodates a full wrap image. It also includes filler text, which you will remove next. Click Choose this Design to customize your cover. Click each text box and delete the filler text. Note: The author photo placeholder will disappear if you don't upload an image. Click Preview to proof your work. The empty text box fields will not be visible on the final cover file.